Once you find the right hotel in Las Vegas and book your accommodations, you may think you're all set to have the best vacation ever, but if you want even more out of your stay in Las Vegas, you might consider asking for an even better view or a bigger room to make your vacation truly memorable. While you can obviously book a better room when you initially reserve your accommodations, upgrading your room is an option that can be done at the time of check-in, and you may even be able to get a better room without having to cover the full difference in costs. 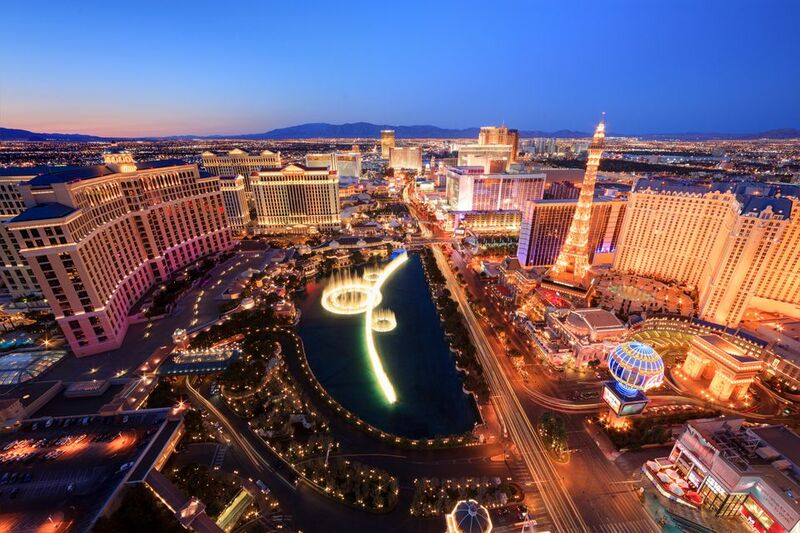 From the 20-dollar trick of sliding a bribe between your credit card and identification to being polite to your desk clerk and booking during the off-season, there are a number of tricks to getting a free upgrade on the Vegas Strip. When checking into any hotel in Las Vegas, you'll have to present the front desk clerk with a valid form of photo identification and a credit or debit card to get your room key. To take advantage of the 20-dollar trick, all you have to do is slide a 20-dollar bill (or higher) between the two cards, and once the desk clerk notices the tip, ask if there are any complimentary upgrades available. Known as the $20 trick, this method of tipping and asking for an upgrade is over 75 percent successful at most hotels along the strip—though it ultimately comes down to the person working behind the counter for whether or not you'll get a free upgrade from doing so. While this trick doesn't always work, it's pretty easy to try, and the most you'll lose from it is whatever you decide to give the clerk for his or her services—which may ultimately get you some free perks even if you don't get a room upgrade out of the deal. You can increase your chances of the 20-dollar trick working by staying during the off-season or booking a basic room when the hotel's basic accommodations are also being rented by a large group (like a group of work convention or conference attendees). During the off-seasons of mid-spring and mid-fall, hotels along the Vegas Strip routinely offer discounts on upgraded rooms, especially if they are having a difficult time filling certain types of accommodations (like suites). The 20-dollar trick is more likely to work during the off-season since upgraded rooms are more readily available and often won't be rented anyway; plus, freeing up your basic accommodations may help the hotel attract even more customers. During work conferences and conventions is another good time to ask for an upgrade from your basic hotel room. Since many companies book multiple basic-level rooms for their employees during such events, hotels often run out of cheaper accommodations, and you may have better luck asking for an upgrade to a suite or nicer room as a result. Another way to increase your chances of getting free upgrades and perks (or using the 20-dollar trick) is to initially spend a bit more money on your accommodations. Hotels, especially in popular tourist destinations like Las Vegas, tend to reward customers who have already made them a larger profit. By booking above the basic level of accommodations, you are telling the hotel that you are prepared to spend money on your trip, especially at their establishment, which gives hotel workers an incentive to potentially reward you so that you're free to spend even more on other optional amenities like room service or gambling at the on-site casinos. You can also book directly with the hotel to increase your chances of getting an upgrade. Instead of using a discount travel website like Expedia, making your reservation directly with the hotel gives you a bit more leeway to negotiate that you may have made a mistake in selecting the room you reserved; the hotel desk clerk may be more inclined to help you get a better space free of charge since you've already shown your loyalty to the hotel. If all else fails, you can almost always pay for the upgrade if you think it is worth it. Unless a hotel is overbooked, you can typically ask for a room upgrade at the time of check-in and will be asked to pay the difference between your reservation fee and the new cost of the upgraded room. Some hotels along the Strip are certainly worth paying the higher costs for better rooms, though. For instance, at Cosmopolitan Hotel, the views are so amazing looking north that you will regret not having a terrace with a view of the fountains at Bellagio; meanwhile, Aria has some very nice corner suites that are more spacious than there regular rooms, and the bathtubs are worth a little extra money at check-in. However, places like Palazzo and Venetian both have large rooms that feel like mini-suites so you don't need to spend the extra money.